I was in a baking mood and my husband was in a cookie eating mood, so I whipped out my copy of Vegan Cookies Invade Your Cookie Jar for a little inspiration, and to give the book another go. So far, it has been a little hit and miss … the hits scoring big points, and the misses still tasting okay, but often a bit too sweet and lacking in the performance category. 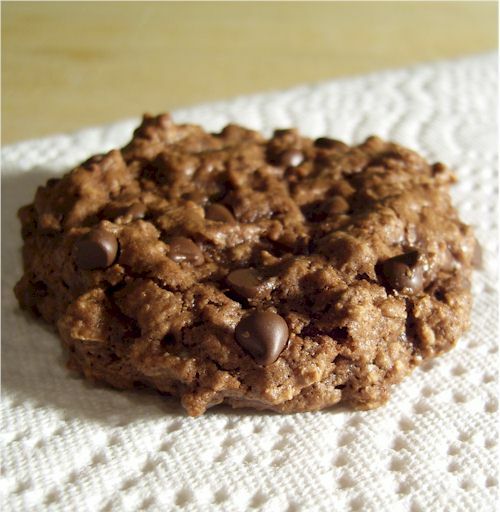 Fortunately, these Chocolate Fudgey Oatmeal Cookies were a hit with the husband … and I liked them too! I omitted the fruit, and added in more chocolate. Craving perhaps? 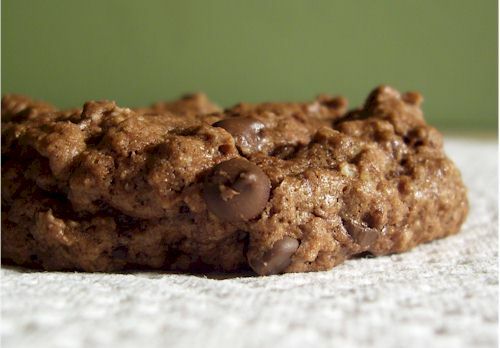 Anyway, these are the chocolatiest oatmeal cookies I have ever tasted … almost like an oatmeal-spiked brownie. I made a few adjustments to the recipe including an ingredient swap or two, but stayed true to the concept. In a medium-sized bowl, combine the oats, flour, cocoa, baking soda, baking powder, and salt. In a large mixing bowl, combine the sugar, flax, milk alternative, oil, and vanilla. Stir or mix until smooth. Add the dry ingredients to the wet, and stir until combined. Stir in the chocolate chips. Drop the batter by the heaping spoonful (a couple tablespoons) onto your baking sheets (I lined mine with a silpat). Shape and flatten the cookies slightly, they only spread a wee bit. Cook for 10 minutes, or until the tops are no longer shiny. I prefer them a little soft in the middle, and 10 minutes seemed to be spot on for this. *I have to admit, plain white sugar (organic if you can) is a standout in chocolate cookies and brownies, but if you want a wholesome alternative, feel free to experiment here with evaporated cane juice or granulated palm sugar. Yum! I used all purpose flour instead of whole wheat pastry and also vegetable oil instead of olive oil and they were still delicious! If the flax meal isn’t meant to be an egg replacement, what is the point of such a small amount? Just a little extra nutrition? So glad you enjoyed the recipe Kayla! The flax is the egg replacer. It gels with the other ingredients. Have you ever used Ener-G egg replacer? If so, would you just use “one egg” amount for this recipe? To sub one egg in a recipe you add 1.5 tsp to 2T of water. There are no eggs in this recipe Amanda. Sorry! I should clarify. How many eggs would you say the flax is substituting. 1 or 2? It’s not really a substitution, as there was no original recipe with eggs. 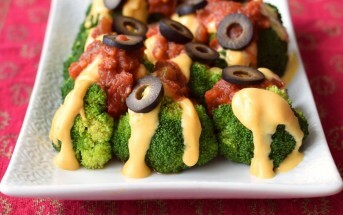 This is originally a vegan recipe. At minimum, 2, but the liquids may need to be further adjusted. I don’t want to make guarantees on straight swaps! I would test with two and then adjust the liquid as needed for the right consistency. I’m trying these babies out today. After shoveling the snow, they sound like what we need. 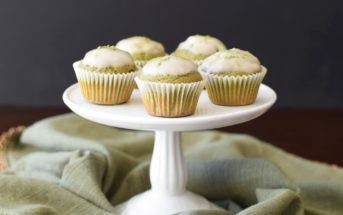 Have you ever tried baking these in mini muffin pan? If so, how long do you think I should I cook them for? I haven’t, but that sounds like a fun idea! I’m really not sure on the timing at all, I would bake at the same temp and just keep a watchful eye. These cookies are so very yummy. My husband kept going back for more. I made half and froze the rest of the batter, which I was glad I did science my son didn’t get one of them. I never tried cooking then in mini muffin tin but I did keep each cookie to one heaping tablespoon and it still took 10 minutes. I will try baking them in mini muffin tins the next time. Thanks so much for this great recipe. That’s so great! Thanks for sharing your notes Cheryl. 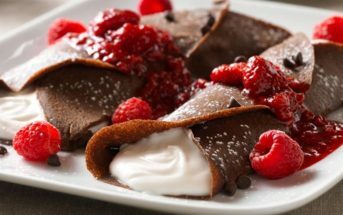 – I probably made some of them a little too big (and one or two broke), but really great recipe. First time I’d ever used flaxseed as an egg substitute! I want to give these cookies five stars and a standing ovation. They are SO good. Pregnancy has made me lactose intolerant, so I’ve been avoiding all desserts since it’s hard to find any without any dairy at all. I LOVE these cookies. And with all the oatmeal and flax, it seems like they would probably make decent lactation cookies too. I’m going to use that excuse to make them after baby is born. My daughter has an egg allergy and was also really excited that she could eat these (and the dough, since she never gets to eat cookie dough). 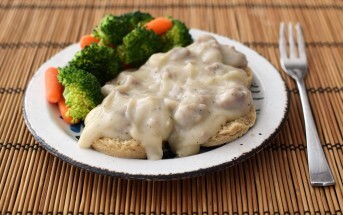 I’m so glad to hear that you like them Nichole and that you found the recipe! It’s become a bit buried in our news section. Thanks for reminding me that I should highlight it again! have you ever read the ingredients on a bag of chocolate chips? dairy. 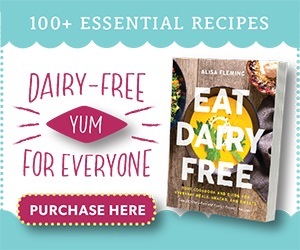 be careful anyone with allergies this recipe is not dairy free!!!!!! lot’s of milk in chocolate chips. sorry i should rephrase. 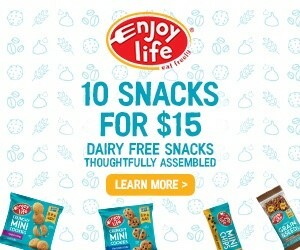 you MUST use enjoy life foods chocolate chips!!!! !